You likely already know your financial picture is not looking the way you want it to right now. 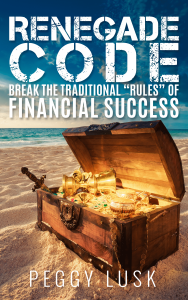 It’s as though someone changed the goalpost and the traditional rules for financial success are no longer working. To make matters worse, it seems as though every financial expert you’ve met or heard about has different advice for you to make the changes needed to move you forward. You’d really like a better understanding about all your options, and what the benefits and trade-offs are for those options, rather than just handing those decisions to someone who will implement their cookie-cutter approach. After all, the impact of the financial decisions you make directly affects you and your family; you’d like to have more understanding and input into the process. If this sounds like you, you need to know the basics of creating a solid plan for your financial future, and how to adjust that plan as your requirements and the world around you change. In this action-oriented book, Peggy Lusk gives you the information you need to know to get started, along with worksheets and templates to gather your financial information. It also provides practical advice about choosing and working with financial services professionals. By drawing examples from her training and experience in the financial services industry, and working with families and business owners to develop their own financial plans, she gives you the information you need to make the key decisions that form the backbone of the plans you follow to create financial success. Some of this material was originally made available through Webinars and a video series, but was difficult to absorb. I knew that putting the information in written format would make it much easier for people to learn. I will be introducing the audio and printed version of the book as well, which should help even more with learning these important concepts. success, rather than focusing on what is really important to me. The catalyst for change for me came one fall, when I returned home from a three-week business trip. I was exhausted from long hours of travel and work, and was preparing to leave again the next day. My husband looked at me and said, “I think it’s time you took a look at some other work alternatives. You are killing yourself.” You see, your family may not want you to make that kind of sacrifice for them. Mine didn’t. I loved my work, and I loved the company I was working for. I was well paid for the work I did, and felt my work contributed to my personal growth and to the profits of the company. But, I was struggling with my weight and knew I was just around the corner from significant health issues. My family history included diabetes, heart attack and stroke, and all were possible if I didn’t change my lifestyle. I felt resigned to continue my current path to ensure my family was provided for, even if I didn’t live to see retirement. Part of building financial wealth is the decision you make about how to bring money into your life. It’s important to me that the work I do aligns with my core values and is work that I love. So, I stepped away from my corporate job to follow a new path: to learn to use the accounting and technology skills I devoted a lifetime to building to create the life of freedom I always wanted, and to follow my passion by helping others who also wanted to take control over their own destiny. I wish I’d done this earlier in my career, but it’s never too late to start. So, what is the code? That each person needs to develop sufficient financial literacy to understand the options and trade-offs of the financial decisions they make; to learn to structure their retirement assets for maximum flexibility and protection; and to pick their own financial experts when they need them. The ship is yours. You need to steer it.